Then check them with sample answers given below. Otherwise, merely reading the following article won’t help you master the answer writing skills. (GS1) Syllabus topic: Important Geophysical phenomena such as earthquakes, Tsunami, Volcanic activity, cyclone etc. [Disaster1]: How are cyclones named? Q. The recent cyclone on east coast of India was called ‘Phailin’. How are the tropical cyclones named across the world? Elaborate. 5 marks 100 words. 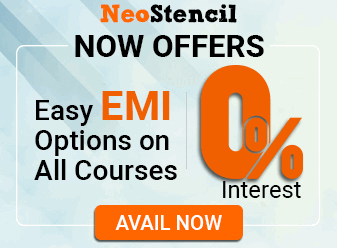 NCERT, Majid, D.R. Khullar, India A Comprehensive Geography etc. don’t throw any light on this. GS1 Mains question paper was “set” on OR after atleast 4th October 2013. (Reason- Phailin was detected around 4th Oct time. At it hit India ~12/13th Oct). So, even if the Professor had not read any of above news articles, still he could not have known that “Phailin” is coming, before October 2013. Meaning, one should not get complacent about current affairs as mains exam comes near. Anyways, let’s first learn the theory, then we form a compressed answer. Traditionally, cyclones were named by weather bodies, according to latitude-longitude method. But it was difficult to remember and communicate the names in numerical or combination of altitude-longitude data. Initially, a committee of WMO (World meteorological organization) started preparing and maintaining the names of cyclones of Atlantic Ocean. Then WMO divided the world Oceans into Basins and assign the responsibility of naming the Cyclones to the respective regional bodies. They all follow their own rules in naming cyclones. Some rotate the same list every 6 years while some are not. Some alternate names between boy and girl, others don’t. How are cyclones named around Indian Ocean? They all suggest names. Finally India Meteorological Department (IMD), New Delhi assigns the name. They select short names so that people can remember easily. Names are selected which are not associated with any person or religious or any controversial issue. From above naming table, cyclones re named in chronological order- form each list, one after another. Please keep in mind: this method is only for N.Indian ocean cyclones. In the Australian region they’ve separate system i.e. alternate naming after boy and girl, and so on. But one rule is common among all five bodies: if a storm causes extreme damage- its name is removed from the list (so it cannot be used again for naming another storm/cyclone). Example: Katrina, Mitch and Tracy. One should mug up Maha=>Pha=>Helen, even for MCQs about “Chronological order of cyclones in given year. Ok this isn’t hard to remember. If cyclone can cause heavy damage, don’t use its name again e.g. Katrina. Hard to recall Mitch and Tracy in exam. Sample Answer: How are Cyclone named? Cyclones are named by five regional bodies of World meteorological organization (WMO), for their respective regions. Each of them free to prepare the list of names and naming rules. for example- For Tropical cyclones in North Indian Ocean region, the Regional body headquartered at Indian Meteorological dept (IMD), New Delhi maintains the list of names suggested by member countries. Final name is assigned in Chronological order of the occurrence e.g Mahasen, Phailin and Helen in 2013. Locally known Short names are preferred for easy communication at grassroot. Names associated with famous person or religion are avoided. If a Cyclone causes extensive damage, its name is struck off the list so it cannot be used again- e.g. Katrina. Physical geography Why landslides occur? Savindra pg. no 209-210. Indian geography Why more in Himalayas > W.Ghats? Spectrum, Geography ch.22 Contemporary issues. Majid Hussain, Geography of India 5th Edition page 17.2 onwards. But not sufficient coverage for this question. 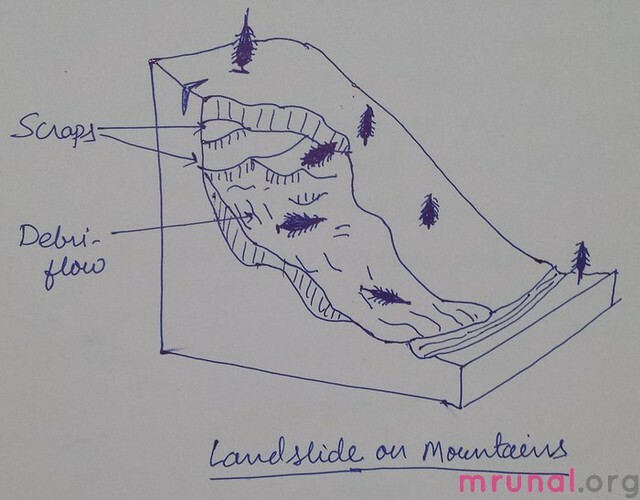 Landslides: The mass movement of soil/ rocks/debris from mountain slope during rainfall/rive stream/earth quake. Eroded and denuded, steep slope on western side, but gentle on eastern side. Western side, small swift flowing of stream. Himalayas not yet reached its isostatic equilibrium =Frequent earth quakes = destabilise the slopes =landslides. Western Ghats located on stable part of Indian plate, deccan plateau. Indian plate is moving northwards and subsiding under Eurasian plate, 5-10 cm a year. Moving of Indian plate does not affect Western Ghats. Winter high snow fall => melts in summer= large flow of debris and landslides. high rainfall on steep slopes on western side = landslides. Timer industry, grazing, shifting cultivation, apple orchards, and dams => deforestation => more chances of land slides. Unplanned growth of houses in the hill areas. e.g. heavy load of residential and hotel structures in Nainital, Uttarakhand. ~250 words, have to compress. Landslides are physical mass movement of soil, rocks and debris down the mountain slope because of heavy rainfall, earth quake, gravity and other factors. Heavy snow fall in winter and melting in summer- induces debris flow, which is carried in large quantity by numerous streams and rivers. Drifting of Indian plate causes frequent earth quakes and resultant instability. Man-made activities: grazing, construction and cultivation abet soil erosion and risks of landslides. Less occurrence of earth quakes because they’re on more stable part of Indian plate. While Steep slope on western side with high rainfall creates idea condition for landslide but gentle eastern slope with low rainfall and rivers in senile stage, does not. Hindu dated 30/Jan/2013, did have a small news on this topic. But not many factors were given. Verbatim answer available in Majid Hussain, Fundamentals of Physical Geography 4th ed., Chapter 24: Global Energy and Temperature , Page no. 383 under subtopic Urban Environment. Explanation: Why Heat islands formed? Albedo is the measure of terrestrial radiation reflected from Earth. Earth is heated, not by incoming Solar insolation(short-wave ) but by out-going terrestrial radiation(long wave) from earth which cannot escape GHG cover. Albedo of soil and green cover (5-10) is much lesser than Albedo of concrete structures (17-27). City =large spread of concrete houses => more terrestrial radiation (i.e. 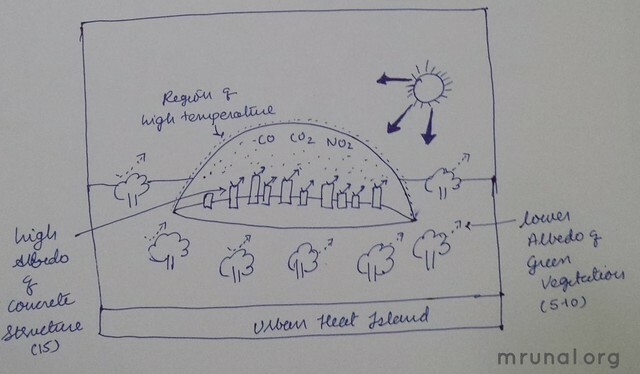 more reflection of sun-light from earth)=> GHG trap this heat=> rise in temperature. Greenhouse gases, Oxides of Sulphur and Nitrogen, and aerosols from automobile, industries and household appliances. The biggest emitters = coal-based power plants, most of them near to urban areas. These GHG absorb infrared radiation, radiating the heat downwards. Deforestation for creating more houses and commercial building=> less tress=less absorption of GHG. Urban surfaces are made up of artificial surfaces with high storage capacity of heat viz. metal, glass, asphalt – they emits out this heat rapidly during night time, which in turn leads more heat. Water cannot penetrate this surface. Thus urban landscape responds much as a desert landscape. Haphazard Building structures tend to interrupt wind flow, resulting into lesser heat loss due to advective (horizontal) movement. Electricity and fossil fuel release an amount ~25-50% of incoming solar radiation. In winters, this increases upto 250% than the incoming solar radiation. Concrete structures have higher albedo than natural soil- as a result more terrestrial radiation is emitted back. But Greenhouse gases from thermal powerplants, automobiles and households tend to absorb this heat, raising the temperature even higher. To build more houses and commercial buildings, tree are cut down- leading to less absorption of GHG. Urban surfaces have high storage capacity of heat, which is emitted back during night. Water cannot penetrate this surface. Thus urban landscape responds much as a desert landscape. Haphazard Building structures interrupt wind flow, resulting into lesser heat loss. Human activities & high Usages electricity and fossil fuel also releases great amount of heat. This question has been asked in previous exams of Geography optional- 1995, 2010. This decrease in of the temperature is called Normal environmental Lapse Rate. But in certain Condition, this is rate reversed (warm air above- cold air below). 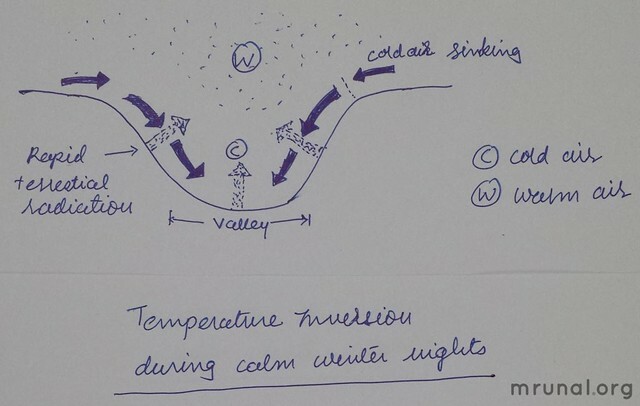 This is called Temperature inversion- most common in mountain valleys. Calm-stable air: so there is no vertical mixing of air @lower levels. At Trapopause (An intermediate layer between Troposphere and Stratosphere),where temperature of air below is colder than air of above layer. Stratosphere contains Ozone layer, which absorbs most of UV rays of the sun=> temperature of stratosphere is higher than Troposphere. Warm air above cold air gets cooler- >condensation-> tiny droplets. LOW RAIN Cold air stays below warm air => it restricts upward movement of the air. This condition discourages rainfall, crates dry conditions. Because of temperature inversion: the Lower slope of the valley are susceptible to fog and frost. Therefore, in valleys the factories, houses and farms are located along the upper slopes. Farmers have to use special fans and heaters to protect their orchards. MEANING Temperature doesn’t decrease with height.Common in mt.valley.Open sky, longer night facilitate. WEATHER fog, smog, frost, no rain, dryness. HABITAT low visible, health problem, crop failure.People settle in upper slopes. Can add diagram / chart to explain theory, and save that much space rather than elaborating the same through words. When temperature increase with increasing elevation, instead of decreasing- It is known as Temperature inversion. It commonly occurs in mountain valleys. Long nights, open sky and clear air facilitate this phenomenon. FOG: When warm air condenses rapidly over underlying cold air. SMOG: when fog is mixed with pollutants. FROST: when warm air gets condensed below freezing point. Atmospheric stability i.e. dry condition and no rain. Fog, smog and frost cause lower visibility, health hazards and crop failures respectively. As a result, In Mountain valleys, factories, houses and farms are located along the upper slopes rather than in lower valley. Farmers have to use special type of fans and heaters to protect orchards. i am not taking coaching frm anywhere so plz tell me cn i relay on NCERT+spectrum for geography of gs paper1. You mentioned ‘solar insolation’ in the urban heat island question. It was redundant. Actually insolation itself contains the word solar as its an acronym of Incident Solar Radiation. Mrunal Sir… Could you please tell us What was the reason that you could not make it to civil services. You are exceptionally intelligent then what went wrong. i could find an article in ToI that throws some light on how cyclones are named. pls find the link. thanks for the help sir …..
the article is really helpful lik all others. Great,very helpful in deciding the way to collect important points and then writing accordingly… diagrams are always a marks fetching point in geography….no need to draw complex diagrams but just draw them lucidly and with some brain involved… excellent…. Thnx sir…. just got involved here.. feeling great n confident that my approach is quite similar to your…… looking forwad for more such guidance n help…. Thnx and regards….